Positive Relationships: Google Wave e-mail Invite? Or was it? 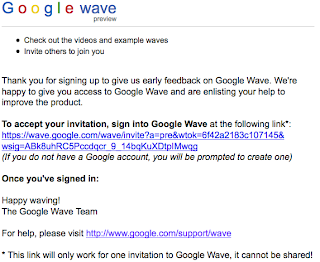 Google Wave e-mail Invite? Or was it? 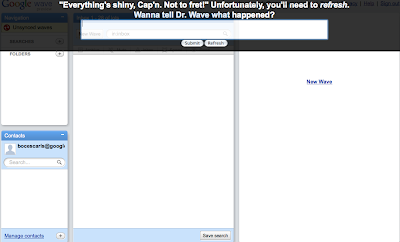 I was incredibly excited to see an e-mail invite from wave-noreply yesterday. I was out in a district, and I didn't open it up until the end of the day because I had tons of work that had to get done. I didn't think I'd get one, and also thought it was a little odd that it was sent on Oct. 1st at 12:07am and not on Sept. 30th, but I thought, "maybe someone from Twitter invited me in". Who cares, I got an invite! I clicked on the link, but it wanted me to add the Google Chrome browser plug-in. "Everything's shiny, Cap'n. Not to fret!" Unfortunately, you'll need to refresh. Wanna tell Dr. Wave what happened? With a submit box to go to "Dr. Wave". Now, I felt like I got scammed and began thinking why did I use IE! Then, I thought, why not try Firefox? NOPE. Same thing. I went to refresh the page....for a second, it looks good.....then same black banner. Try it on another computer - same thing. Download Google Chrome! YES, that has to work! NOPE. Try it on a Mac with Safari - No. At home, on another computer - No. I came back to work today, maybe? Maybe? NO. If I go to My Account in Google, I see Wave listed under My Products. I've posted to the Google Wave Forum and wasted a night trying to figure this out. Did I do something wrong? Maybe it was the Google Chrome plugin? Let's just say it's been a frustrating day. Then again, I'm frustrated over a Beta product that's free. Maybe it's trying to tell me that I have too many other things going on? I would like to try it out this weekend, though. Can anyone help? Great! It's up and running fine as of Friday morning (Oct. 9th). Need a contact on GW? What did you do to fix the problem? I have the same problems that you describe and have tried several different browsers with the same results..... just "Everything's shiny, Cap'n. Not to fret!" Unfortunately, you'll need to refresh.